Week 10 reporting, for Wednesday March 7 - Tuesday March 13, has replaced week 9's figures in my version of weekly reporting. The record low pricing for a single day occurred on Sunday, and the weighted average price for the week, $11.74, was the lowest weekly average price since 2009. Predictably, the depressed pricing corresponded to a record week for wind output. 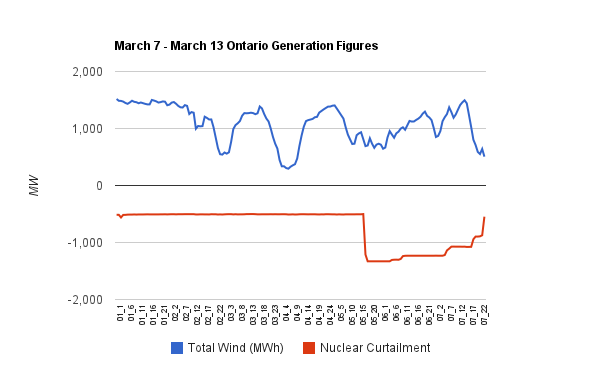 There still hasn't been an hour, in 2012, when Ontario was a net importer of electricity. My tools for tracking curtailed sources of power again weren't very helpful, although there was some steaming off at the Bruce B units on Sunday before Unit 8 was once again pulled offline as pricing went negative in the early afternoon. 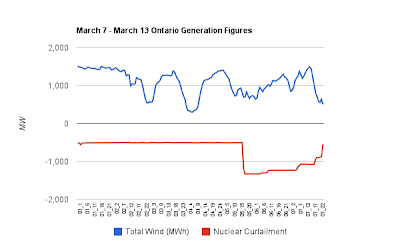 I indicated last week that the IESO, Bruce Power, and OPG, don't announce the idling of reactors, but the evidence remains, so I have once more created a graph assuming Pickering 7 and Bruce 8 were removed from service for supply curtailment reasons, to show how much wind produced against the curtailed nuclear production. During week 10, wind produced 182,320 MW, which was almost 100GWh more than in 2011's week 10, and demand was 144 GWh less. Hydro and coal output were up minimally, meaning a lot of cutting to other production, or dumping, needed to be made. Exports rose 50GWh over 2011's week 10, nuclear production dropped 87GWh (the graph showing all of that), and gas production was the big down figure, off 151GWh.